and have peace with one another. 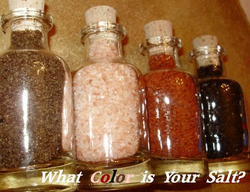 What color is your salt and pepper? Now available in Coarse, Fine & Powdered grains. One of the purest salts available for culinary and therapeutic uses. The crystals range dramatically in color from off-white to a lustrous pink, indicating 84 trace elements & iron. Highly beneficial, primarily used for gourmet cooking and in bath preparations. Delicious clean and pure taste, no metallic aftertaste. Offered in small crystals or we finely grind the pink salt to a smooth and silky powder. Try it with popcorn, cooked or raw veggies, and any meats for a fabulous pure taste treat. This Pacific Northwest sea salt is slow-smoked over Pacific Red Alder wood. Full-bodied, rich, with hints of sweetness and no burnt or charcoal taste. A favorite with chefs all over! This is a favorite in our family. We enjoy this on burgers, steaks, and in navy bean and cream of potato soups. We've even sprinkled it on baked potatoes! Wow! A traditional salt of the Hawaiian Islands. Used to season and preserve many foods. Its distinctive color and delectable bold flavor has made it a favorite of chefs worldwide! Try this on meats, fish, raw foods, and rice dishes. This finishing salt is naturally infused with activated charcoal and exceptionally high in essential minerals. Delicious on barbecued meats, stir-fries, roasted vegetables, salads and beautiful on baked potatoes. These fully ripened berries add a delicate peppery warmth that builds zesty momentum with each bite. White Peppercorns and Black Lava Salt make an intriguing and delicious pair. A classic and bold table pepper that adds the perfect touch of complexity to any dish. Our pepper berries transform past notions of what black pepper can do! These beautiful crimson berries are strikingly sweet and spicy with a bright citrus perfume. Try them with Himalayan Pink Salt for a unique presentation and alluring taste experience. These young green pepper berries are uniquely fruity with a subtle heat. A lovely and mild table pepper that will bring a delightfully crisp flavour to your culinary creations. The rare long pepper rod has been used for centuries in Mediterranean, African, Indian, and Indonesian cooking. It's unique deep savory flavor is alluring for the discerning pepper palette. A relative of the species piper nigrum, but with a much more earthy multi-layered essence. The discerning palette may experience five overtones including chocolate, coffee, licorice, floral and lastly rest on a warm black pepper base. Stop by our booth at the market to see, smell and taste the unique differences these peppers have to offer family and guests at your table. A unique gentle smoked table pepper that adds the perfect touch of piquant heat and complexity to any dish. Enjoy and pair this smoked black pepper with our Pacific Smoked Alder Wood Sea Salt for the ultimate true smoked flavor with no artificial ingredients or aftertaste. Absolutely a one of a kind smoked spice experience.